A professor of mathematics is teaching a class, and in the middle of a proof says "Clearly we have the following." A student puts up their hand and says: "That's not clear to me." The professor stares at for a bit, then without another word gathers up their lecture notes, and leaves. When the next lecture comes around the professor enters, waving a sheaf of papers and declares triumphantly: "Yes! It is obvious!" Clearly (for some definition of the word) we are expected to find it amusing that it takes many hours of work and many pages of working to discover that something is "obvious", and yet the word and its ilk persist in the literature. "Clearly" this, "obviously" that, and no, it's not at all obvious to me. All you're doing is making me feel stupid. But that's not the intent. At least, we would hope it's not the intent, and it certainly is not the intent when I use it. So what is the intent? What does it really mean? There is a way of thinking about "clearly" and its relatives that makes it clear that the word is serving a positive purpose. It goes like this. Let's suppose that the author does, in truth, find this obvious, and yet I don't. What does that tell me? It tells me that I'm not looking at it the right way, or from the right point of view. Take a point, and three lines through that point. ... then another. 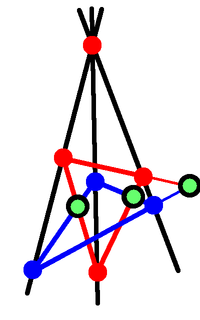 We'll assume these triangles are in arbitrary positions, with no two sides parallel. 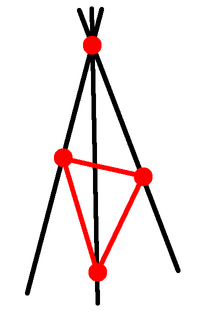 Extending the triangle sides if necessary, consider the intersections between corresponding sides. Since the sides are not parallel, such intersections will exist. These three intersections will be co-linear. If some of the lines are parallel, they will not meet. 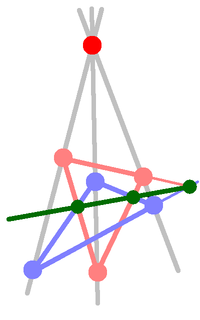 However, once the version where they do all intersect becomes obvious, because you're looking at it the right way, the appropriate generalisation is then easy enough to find. My thanks to Eric Anderson for an email pointing out that this is an issue. This is obviously true. No, really, it is. The way to see it is to pull the middle line out of the page so the original three lines form a tripod. 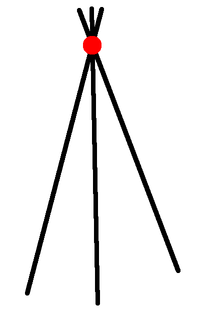 Then think of each triangle as the intersection between a plane and the tripod. 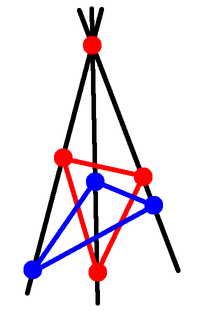 The two planes meet in a line, and the intersections between the corresponding sides are on that line, and once you see it, it's nearly impossible to unsee it. It becomes obvious, once you think about it the right way, and stand in the right place. Lots of people think that the best teachers explain things really clearly, but in maths, that's not necessarily the case. Sometimes you can get a clear explanation that you follow perfectly, but then hours, or even minutes, later you can't actually remember anything. Sometimes, especially in maths, you need to struggle through things yourself to get a real sense of why things are true. Maths is not a spectator sport - you need to engage the problems yourself, rather than just listening to the story of what someone else did. Otherwise it's like watching sport instead of participating - you just don't get the benefit. So use the word "clearly" as a clue that here is a place to engage with the material. If it's not already obvious, then there is something to be gained by putting down the book, paper, whatever, picking up a pencil, pen, or scribble stick, and having a go. What has all this to do with the original question? When an author writes "clearly" they are saying "Once you are thinking about this the right way, this is obvious. If it's not (yet) obvious, you are not (yet) in the right frame of mind to progress. You need to change how you're thinking about it. Read on, by all means, but it might be worth working on this bit for a while to see if you get the insight necessary to make this obvious, and that will help to make what follows obvious too." OK, maybe they don't always mean that. Maybe sometimes they really are saying "I'm cleverer than you," but if you use this as a coded message to say "This bit requires some work to get into the right frame of mind," then you can turn it into something constructive.